For the last couple of months, I’ve been in residency at Kadist Art Foundation in Paris, France. This is a private foundation initiated in 2001, which has been forming a collection of contemporary art, and organizing exhibitions and residencies. I am curating their upcoming exhibition, Archaeology of Longing (Archéologie de la Chine), which takes place at Kadist’s gallery from September 19-November 9, 2008. With a title drawn from a short story by Susan Sontag, Archaeology of Longing is an exhibition bringing together a number of artworks, artifacts, and common objects. It begins as an investigation into disenchantment, soon digressing through the historical flatlands of interpretation and substitution. Far from melancholic, and closer to what can be described as politically intimate, the exhibition is an inventory of that journey. Archaeology of Longing includes artwork by Alejandro Cesarco, Luca Frei, Emma Hedditch, Bethan Huws, Fabio Kacero, Rober Racine, Kay Rosen, Kateřina Šedá, Joe Scanlan and Lisa Tan; artifacts and objects on loan by several contributors, including Tania Bruguera and Archives Erik Satie; and exhibition furniture designed by Tomás Alonso. A series of events will take place as part of the exhibition. On the evening of September 18th at the garden of the Musée de Montmartre in Paris, Emma Hedditch performs a new work and Luca Frei makes a reading of his artist’s book, The So-called Utopia of the Centre Beaubourg – an Interpretation. On the night of November 1st, Lars Svendsen gives a lecture on his Philosophy of Boredom at Kadist Art Foundation. A collection of findings uncovered during this archaeology of longing is also available as a publication titled 84 handkerchiefs, an umbrella and some books. 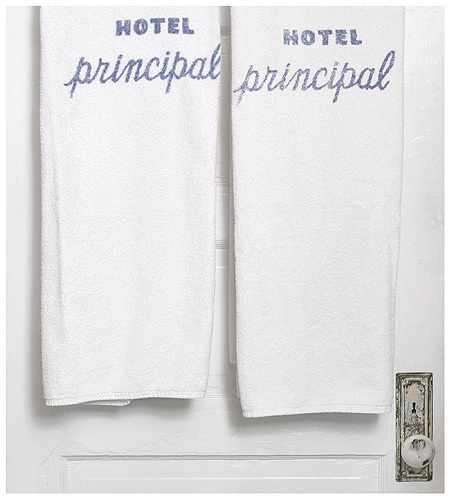 Image: Lisa Tan, Hotel Principal Towels, 2008, C-print, 76.2 x 101.6 cm. Courtesy the artist and D’Amelio Terras, New York.